Now there is a whole book that is completely devoted, cover to cover, to vintage Japanese sports cars. "Classic Japanese Performance Cars: the History & Legacy" is a 144-page book measuring a large 8.5-in by 11-in in size. Learn more about the Toyota MR-2, the 2000 GT and, of course, the Toyota Supra. This book will cover the iconic late 60s Datsun 240Z and the Nissans that eventually followed in it's wake. Vehicles once raced in the 1970s and 1980s are featured in this book. Learn more about the designers and the visionaries behind breakthroughs in engine design. The book also traces the progress of many of these performance cars until they reached the American market. There's a growing fan base for this era of sports cars from Japan, and this book should expand interest even further. Learn more about Mazda's rotary-powered vehicles, starting with the Cosmo Sport and running through the RX-7. The Mitsubishi Galant GTO and the Lancer are included within the pages of this publication. The Subaru 360 in the Honda CR-X are featured as well. Each chapter is devoted to one of the major Japanese automakers. 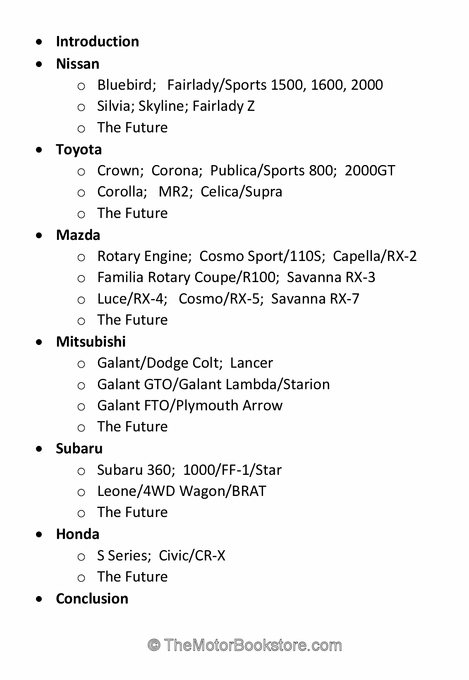 In the first chapter, Nissan's Bluebird and Fairlady/Sports 1500, 1600, 2021 models are discussed. The Silvia, Skyline and Fairlady Z are also highlighted. In chapter two, the Japanese performance cars contributed by Toyota are featured, including the Crown, Corona, Publica/Sports 800, 2000 GT and Corolla. Learn more about the interesting history of the MR-2 and the success of the Celica/Supra. In chapter three, learn all about Mazda's dramatic foray into rotary engines. The chapter focuses the early Cosmos Sport/110S and the Familia Rotary Coupe/R100. Then, it moves on to the Kapalla/RX-2, Savanna RX-3, Lucy/RX-4, Cosmo/RX 5 and the Savanna/RX-7. Mitsubishi's Galant variations and the Lancer get a lot of attention in the fourth chapter. Explore the history of the Galant/Dodge Colt, the Galant GTO/Galant Lambda/Station and the Galant FTO/Plymouth Arrow. Subaru is featured in the fifth chapter. Take a nostalgic journey through the world of the Subaru 3600, the 1000/FF-1/Star and the Leone/4WD wagon/BRAT. In the sixth and final chapter, learn about the history of the Honda S Series and the Civic/CR-X. Finally, each chapter concludes with a discussion of what the future holds for each automaker. This book is a "must-have" for Japanese performance cars enthusiasts and collectors alike. The book features the iconic Datsun 510 on its cover, a vehicle that still remains one of the most desirable nostalgics for both racers and collectors. Learn about the history of the Mazda Cosmo Sport, the world's very first rotary-powered sports car. The racing prowess of some of these Japanese performance sports cars was such that they ultimately impacted the engineering of certain future American models. 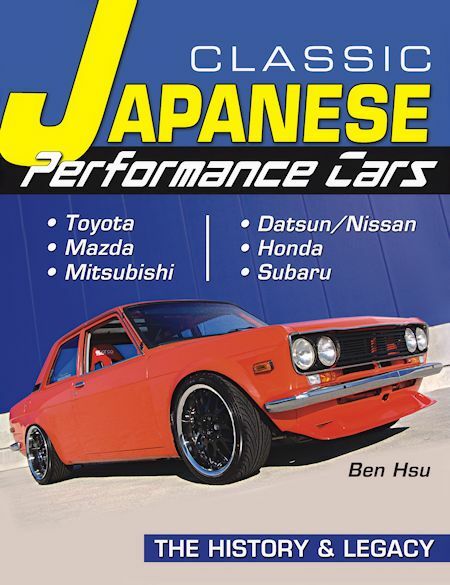 "Classic Japanese Performance Cars: History and Legacy" is available as a paperback and will ship today. It is published by Car Tech. The book will take you on a journey that is at once both nostalgic and educational. Get great tips that will aid you in your restoration and/or your upgrades. Learn more about the earliest predecessors to your favorite Japanese vintage rides. Ask a question about Classic Japanese Performance Cars: The History & Legacy.